Geoff Holt - record-setting yachtsman & inspirational speaker. Paralysed from the neck down after an accident when he was 18, Geoff Holt has not let his disability stop him. He is a record-setting yachtsman and an ambassador for disability sports. He is an engaging and inspiring speaker, encouraging his audiences to face whatever challenges their lives bring. Geoff Holt is a record-setting yachtsman and award-winning entrepreneur whose drive and spirit have audiences mesmerised. Geoff sailed his way into the history books in 2007 when he sailed solo around Great Britain. Paralysed from the neck down since an accident when he was 18, Geoff’s achievement was highly acclaimed as both extraordinary and courageous. Geoff didn’t stop challenging the seemingly impossible: in 2010 he became the first quadriplegic to sail unassisted across the Atlantic, a voyage of 3000 miles. Recognition of Geoff’s remarkable achievements came quickly. 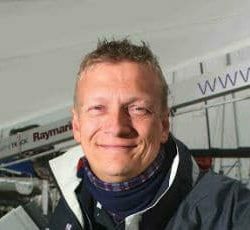 He was voted BBC South Sports Personality of the year in 2007, received a British Airways Great Briton Award and the RYA Francis Elkin Award in 2009, an MBE for his services to disabled sailing in 2010, and the prestigious YJA Pantaenius Yachtsman of the Year in 2011, an award that Geoff considers the ‘Knighthood of Yachting.’ Geoff’s entrepreneurial skill was recognised in winning the Stelios Award for Disabled Entrepreneurs in the UK in November 2015. Geoff is CEO of Wetwheels, a company that provides boating opportunities for people of all ages and ability. He has a very inspirational view of life, sport and business and the opportunities they provide, and his positive outlook comes across strongly in every speaking engagement, engaging and inspiring his audiences. Although sailing is a key element in Geoff’s life, his story is not about sailing but about the power of the human spirit, and he captivates his audiences every time he tells it. His talks are a journey through the life of an extraordinary man, told with passion and wit, engaging the audience by making them feel involved in every step of his journey. He demonstrates, with great sensitivity, our ability to face challenges when they present themselves. Above all, his story leaves audiences feeling positive and inspired to do something great within their own lives. Geoff’s talks are highly motivational and filled with humour as well as thoughtful insights. He has faced adversity and challenged limits, and he continues to inspire others to maintain a positive attitude no matter what challenges they face. His work as a disability sports ambassador has inspired countless others, and his personal philosophy encourages people to live life to the full and conquer whatever challenges they face.